I get e-mails and questions about Fern’s sleep set-up quite often, so I thought I’d finally share a full post about our Montessori floor bed experience…the what, the why, the when and the how. A floor bed is exactly what it sounds like…a bed on the floor. It sounds super weird to a lot of people in our culture, but it’s totally normal in other parts of the world. The idea of the floor bed is based on Montessori principles of allowing children to explore and learn through their environment. As such, Fern’s room has always been set up in a way that was geared toward her and in a way that was totally safe for her stage of development. We started Fern out in her floor bed between two and three months of age. Before that we were bed sharing and as much as I loved the idea, I was getting zero sleep and just couldn’t deal. I had so many aches and pains from sleeping in weird positions and Fern just wanted to nurse non-stop since she could smell my milk. It just didn’t work for us. At this stage she obviously wasn’t mobile and was still being swaddled at night, so honestly this wasn’t much different than her being in a crib since she wasn’t exactly going to be getting up and exploring on her own yet. Our set-up was a crib mattress which we put in a corner of the room to prevent rolling and on the open side of the bed we cut a pool noodle to the length of the mattress and stuck it under the crib sheet to create a barrier. Fern took to the floor bed immediately. This is her when we first started her in it at 2-3 months. As she got bigger and started scooting out of her bed, she would wake up in the mornings and play with her toys. It was nice for both of us, because she got to learn and explore on her own, creating a bit of independence and I got a happy girl who didn’t wake me with screaming every morning. Many mornings she would play happily for up to a half hour on her own. Sometimes she would wake up and play for a bit and then fall asleep again for another hour or two (usually on the floor) – actually this is what happened most often. I loved this. She would wake up non-stop to nurse all night long, so the mornings felt like a bit of a reprieve for me and it was wonderful. I will admit – floor beds are the easier when babies aren’t yet mobile, or have limited mobility, for obvious reasons. I will say that setting up a room for a floor bed does require a little extra effort. 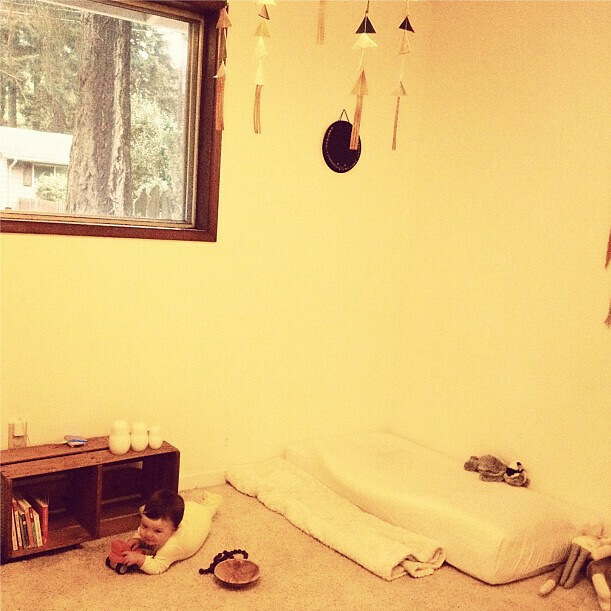 The amount of things you can keep in a Montessori style room is limited, because you want to create an environment that is calm and promotes sleep, but also one that provides encouragement for exploration in a way that isn’t too overstimulating. The only toys we keep in Fern’s room, even now that she is older, are soft toys/dolls, books and a select few manipulatives. I want her to have things to do in her room, but not too many things, because I want her to actually sleep, and so far it’s worked well. All of her other toys are in baskets for her to play with during the day throughout the rest of our house or stored away to rotate out as needed. This girl wasn’t a good napper until she was about a year old. Naps never really happened on the floor bed. We’ve tried them, but they just never really took. Fern refused to nap unless I laid with her for the first 9 months of her life and then she finally decided to get on board with the Pack ‘n Play and she’s been napping in it ever since. Recently I’ve tried to get her to nap in the floor bed, but it was a fail. She’s just not tired enough in the afternoon to lay there and sleep. She will nap like a champ in the Pack ‘n Play, because she doesn’t have any other options, but in the floor bed she could stay awake all day. I’m pretty sure she’s going to be one of those kids who drops naps early anyway, because already she will go a day or two without naps despite my best efforts. I know she needs them still, but she’s stubborn and will fight them to the bitter end. I know using the Pack ‘n Play isn’t very Montessori of us, but I don’t care. It works for us and that’s what parenting is all about – finding out what works for your family and your child and doing that. When Fern started crawling in full-force around 10 months of age, she decided she hated the floor bed. Like…hated it with the fiery passion of a thousand suns. Every night when I would lay her down for bed she would scream and cry and crawl over to the door and bang on it until I came back to rock her. She would do this over and over. I was never into letting her cry it out. Tried it for a bit and it just wasn’t my thing, but at this stage since she was a little older, I would let her cry for a few minutes and if she did stop, it meant that she fell asleep while banging on the door and would fall asleep laying right in front of the door. Not very safe in case I needed to get in quickly which totally stressed me out. After a few weeks of this, I realized this just wasn’t working for the here and now. I felt like I was pushing the floor bed so hard because I really wanted it to work, but the fact was, it wasn’t working for my child, and eventually I got rid of my pride and listened to her and what she was telling me she needed. We moved her Pack ‘n Play into her room and she started sleeping like a champ again. Like…12 hour stretches…insane. I was resigned to having her sleep in her play yard until she went to college, because honestly I was just so happy to finally be getting sleep and I didn’t care how I got it. My husband kept nudging me to try the floor bed again now that she was walking so proficiently, but I resisted. I just didn’t feel like dealing with it. Then I went away for a weekend work trip when Fern was 15 months old and Craig reintroduced the bed again and she was totally ready. She didn’t miss a beat and it was like she had never stopped sleeping on a floor bed. The only thing was…she didn’t really like the actual mattress. Every night after I tucked her into her bed, she would get up and go sleep in her teepee. I think she really liked the fact that it gave her a bit of a boundary which helped her to feel safe, but also gave her the freedom to get up and explore. After about a week of this, we ditched the mattress and just started putting her to sleep in her teepee. I layered a bunch of quilts as a mattress and filled it with cozy pillows. She loved it! Sometimes when I was rocking her to sleep, she would look up at me and say “Teepee Mama.” to let me know that she was done being rocked and ready to go sleep in the teepee. It was really sweet. Fern enjoyed her teepee from 15 months until just a few weeks ago. At 22 months of age she was getting a bit long for her little teepee and we felt like the quilts probably weren’t super comfortable for her to sleep on. We decided to upgrade to a big girl bed. We decided on a full so she could grow into it and I’m so glad we did. It gives her plenty of room to move around while she sleeps without me worrying about her falling off and I like that I can lay down next to her when I’m singing to her at bed time. I was a little worried about how the transition would go, because I knew how much she loved the teepee, but it was totally fine. She loves her new bed and I love that we have our not-quite-two-year-old in a kid’s bed and we avoided all the challenges that can come with a transition to a kid’s bed. I watched friends have to go through that and it’s definitely something I’m glad I was able to avoid. 1. How do you get her to stay in her bed? The short answer is, I don’t. That’s the point of a floor bed. Your child is free to get up and explore their environment. Some nights when I lay Fern down to sleep, she is ready to sleep. Other nights she is not and will get up and collect all the dolls in her room to play with or lay in bed singing songs for an hour or more. I give her the freedom to trust that she will sleep when she is tired. This might not work for all kids, but it works for us and for the most part she stays in bed and goes right to sleep. 2. If I tried this my kid would just keep opening the door and coming out of their room. How do you get her to stay in her room? I think because we started so early, Fern just knows that her room is a place for rest. She doesn’t come out in the night. Actually, she did come out of her room the other day for the first time right after I laid her down. She came out twice, but I think it was because my parents were over and she knew they were still here. I walked her back to her room and told her it was time for rest and I needed her to stay in her room until morning and she did. She hasn’t done it since. I would absolutely use a floor bed again and fully intend to with our next child. I think the key is knowing your child and listening to their needs and cues. 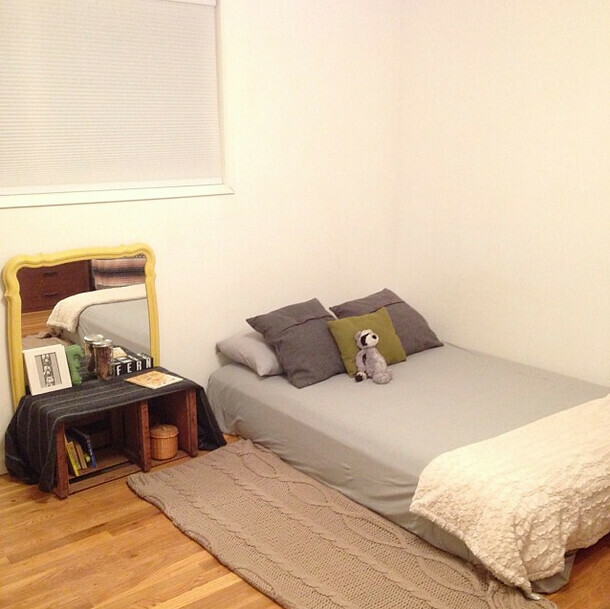 A floor bed might not work for every kid and it’s important to hold onto the idea lightly. As you can see we have modified our approach quite a bit to work with Fern and her needs at certain stages of development. Remember that it’s OK to try it and abandon it for awhile if it isn’t working and then maybe come back to it again. Do what works for you and your child. Any other questions I’m leaving out? Hopefully this is helpful for those of you considering a floor bed! Thanks Suzannah! I think she’s pretty wonderful. We started a floor bed at about 16 months with Pearl for naps and then transitioned to bedtime. I didn’t have any great reasons for doing it though except that we had an extra mattress and didn’t want to spend money on a bed, ha! It will be interesting at naptime once she realizes she is actually tall enough now to open the door. Kira – Fern just learned how to open doors a few weeks ago and it’s definitely made for earlier wakeups, which is kind of a pain, but not the end of the world. She came out of her room a couple of times, but quickly realized it wasn’t going to fly. It’s been totally fine though. I may get safety knobs for the inside of the door if she seems like she might try and wander in the night though. If the child gets to the point where they can open the door. Use one of those safety caps they put over doorknobs to keep kids from wondering out the front door. The work good for keeping kids from leaving their bedroom in the middle of the night. it was great to read this. I was about to email you to ask you about the floor bed bc i wanted to try it with my next baby (due in a few months). i guess the transition from crib to bed was horrible for us and we ended up stressing too much about it. in the end, our son sleeps on a floor bed at the moment. i don’t think we’ll get him a frame as we also consider the bedroom as a place for rest, not play. 🙂 thanks for this post! Noe – I really do think the earlier you transition the easier it is. Starting them right away makes it super easy. At least in my opinion. This is so awesome…I’m hoping to transition her from a crib to a floor bed?! I wonder how that will go! lol Quick question…what did you do about plugs? do you have anything plugged in? We don’t keep anything plugged in except for her sound machine and that plug-in is behind her dresser where she can’t reach it. 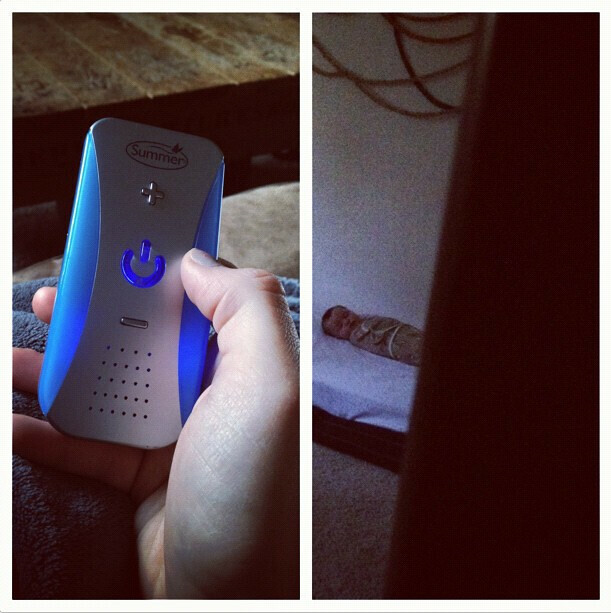 We don’t have a baby monitor anymore (ours broke when she was about a year), so just the sound machine plug. All the other plugs have outlet covers. Hope the transition goes well for you. Honestly, there were hard days, but don’t give up. It gets better and if it doesn’t try again later. No shame :). Thanks for the post! I read your original post about Fern’s floor bed (on Babble maybe?) and it inspired me to try my little in one. She loves it, I love it and my hubby and I are ready to sell the crib and just use floor beds for any future children. Yay! I’m so glad my post inspired you Jill! I really can’t say enough good things about the floor bed and I’m glad you had such a great experience too. My 2yr old is a great overnight sleeper and an awful napper. Usually we just cuddle on the couch and he falls asleep. Maybe we need a teepee?! Kidding aside, thanks for sharing how this works for your family! I do a floor bed with my almost-2 year old as well. We took the door off of her bed room when we were setting it up and replaced it with a baby safety gate that opens out. There are so many ways to make the space work for you and the no door thing made me more comfortable and made it so we had no need for a baby monitor or anything like that which would need to be plugged in & need a table. We started right away with a regular twin size mattress. Memory foam kind to avoid bouncing. We also have a tent in the room that Leona ends up in some nights! When I started this I had no idea that it had a name or a philosophy behind it. We were just doing what makes sense for our space and worked for us. We love it & so does Leona! Switching subjects 🙂 where did you find the white nesting dolls in the second pic? Thanks for this! I’m in third trimester with my first and getting organised, thinking to plan for a floor bed after having a co-sleeping crib for the first months. Your detailed report is most welcome! The question that lead me here was about how early to transition to the floor from the crib. Interesting about naps, where is your pack n play set up? @Jessie – I think I mention it in the post, but we switched from bed sharing to the floor bed around two months. I truly do believe that the earlier you do it, the better. That said, some mamas may want to co-sleep or bed share for longer than that, which I think is great, but it just didn’t work for us. As for the pack ‘n play it was set up in the corner of the room when we used it to minimize the amount of space it took up. We ditched it completely for naps a couple of months before she turned two and it’s been fine. She doesn’t nap every day, but I don’t think it has to do with the bed…it’s just her personality. She does have quiet rest time in there though and it’s been great. Thanks Lauren! Yep, 2-3 months was the data I was after 🙂 You mean the pack n play was in your (parental) room? Our rooms have really different light/noise so I’m trying to figure out the best way to establish day/night sleeping places. Anyhow, thanks again! @Jessie – The pack ‘n play was always in our daughter’s room. I just pushed it off to a corner until nap time. Once she was out of our room, we never brought her back in. For a short stint she napped on our bed and I would lay with her, but it just didn’t work out well. I love this so much! I am trying for a baby, and I plan on doing exactly what you’re doing, so I was just looking at some simple things to add to the room. One question for you: Where did you get the tee-pee? I think that might prove to be an awesome addition if needed. My mother and father-in-law actually made the teepee. you can find them online though. Thanks for your post. I was hoping for some advice…My 7 month old has been in a floor bed for a few weeks now and it had been great up till two days ago when he started to crawl to the door, pull himself up, bang on the door and cry for me to return! It is so painful to hear and watch on the monitor. I go in to comfort him (after about 10-20 min) and have been caving in by nursing him to sleep instead of just letting him cry because the banging and standing at the door (and then sometimes falling over) feels so intense. He is also teething rigth now and probably needs his momma a bit more so than usual. I am not sure what to do and am considering going back to the pack and play like you did. I just wonder if it’s a phase and I should stick it out or if I should try other tactics before switching back to his pack and play so quickly. Any advice would be super helpful!! Thank you! @Liz – I would just suggest waiting it out for a bit, but if it’s not working, don’t be afraid to take a break and reintroduce the floor bed later. Sounds really similar to what happened for us. He could be going through a developmental change…maybe teething or a growth spurt, so try to be aware of these things. Above all, just remember that you are the mama and you know your child better than anyone. Good luck! Did you nurse her to sleep while she was on the floor bed? Or nurse her in the rocking chair and then lay her down? I’m considering doing a floor bed for my 8 month old. I know she will wake up if I lay her down after nursing. @Morgan – Usually I just nursed her to sleep in the rocking chair and laid her down. Sometimes I laid down and nursed her, but I felt like that was more disruptive though because of the noise it made when I’d get up. Hi Lauren, I have a six months old baby boy. He used to sleep on the crib until a week ago when I introduced to him the floor bed. So far, he sleeps like the way he does on the crib although still gets up every three hours (which I was hoping it will change when using floor bed). I also noticed that he always falls from his bed (that disturbs his sleep) although I put folded duvet beside the bed so when he falls it won’t hurt him. I wonder if the crib bed is too small since he rolls over now and started to be a “pro” crawler. What do you think is the right size for floor bed? Thank you! @Cathy – We used a crib mattress until the time our daughter was 10 months old at which point we took a break and used a pack ‘n play for a bit, because it wasn’t working well. Reintroduced around 15 months and she slept in a teepee on a pile of quilts until she was about two and we transitioned her to a full-size mattress. I think a bigger mattress would definitely be a better option. More room to roll and if you plan on having a bigger bed eventually, you might as well just switch to the bigger mattress now. Do you allow her to play in her room during the day as well? 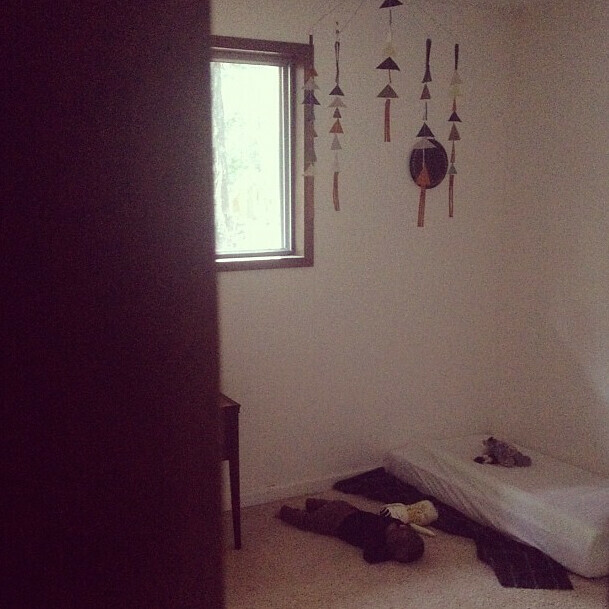 Our daughters room is kind of half a play room half a bed room, so I wonder if that would breed bad sleeping habits. Any thoughts? @josie – She does play in her room now that she’s older, but I don’t keep many toys in there and not during rest times. She mainly has stuffed animals/dolls and books in there. The rest of her toys are stored throughout the house to encourage her to play elsewhere. It hasn’t been a problem. I will say that until the time she turned two, I kept a very minimal amount of items in there. Only recently have I added to it. Hey! I was just wondering where you bought the gorgeous teepee? @Emma – My in-laws actually made it for my daughter. You can find them online though! I’ve referenced your excellent post in my post about floor beds here: http://makegrowshare.blogspot.com.au/2014/10/our-floor-bed-pre-rolling.html I hope you don’t mind! Your experience with Montessori had influenced me when we finally had Colette. I have a question for you regarding Fern’s transition to floor bed. I notice that in one of the photos she is swaddled, when did you stop swaddling? Did you still have nightly feedings? Did she have trouble adapting? Colette is almost 4 months now and sleeps in her bassinet, swaddled. I’ve tried unswaddling her to prepare her to transition to her bed, but it just isn’t working. She goes to a Montessori daycare and most of her naps she sleeps unswaddled, but is on her tummy. Since I cannot monitor her at night, I don’t really want to put her on her tummy. Any advice for this sleep deprived mom? @Kate – We swaddled Fern until she was somewhere between 5-6 months old. She started rolling over more and it wasn’t safe to have her swaddled. Crib or not, you’ll probably have to break her of the swaddle around then unfortunately…and believe me…the swaddle was like my life line, so I know your pain. We started by taking one arm out and swaddling her that way for a week or so, and then both arms and did the same thing. Then after a couple more weeks we ditched it altogether. As for tummy sleeping, I’ll say that I worried about it too and while I can’t give you advice on this, because it’s obviously your decision and I am not a sleep expert qualified to tell you about safety, I did let Fern sleep on her stomach once she could roll over safely. I kept going in her room and finding her on her tummy even though I’d lay her down on her back. I’d flip her back to her back and did that for a week or so on the advice of her doctor, but after awhile I decided that if I put her to sleep on her back and she woke up and rolled over, than I was OK with it. She slept INFINITELY better that way anyway. We still did 2-3 night feedings for ages unfortunately. I was tired, but it was still better for me than having her in our room. She slept terribly in our room. 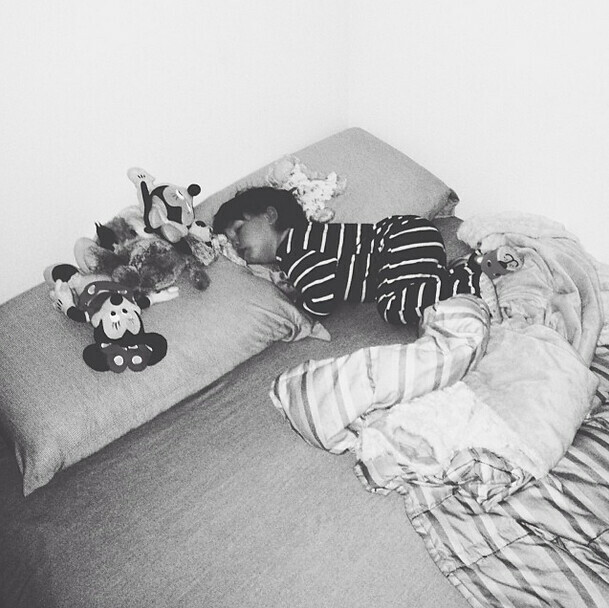 Baby brother on the other hand sleeps like a dream in our bed, so I’m dreading putting him in his own room. He’s such a light sleeper unless he’s cozied up next to someone! Let me know if you have any other questions! So I’m totally new to this Montessori thing but totally in love with the idea. I wish i had learned about it sooner! My little girl is going to be 18 months next month. She’s slept in a crib since about 6 months (we co slept before). I really like the idea of a floor bed but I worry that it may not work for her since most nights she cries for a few minutes before going to sleep when we put her down (or she wakes up if i move her from falling asleep else where and cries). Any suggestions? Thank you so much for this post. I’m glad that I worked so well for you. My daughter just turned a year on the 16th and I’m wanting to try this with her. Last night I put a twin sized mattress in her room and she rolled off so I will try it again once I have a bigger sized mattress. Where did you get your teepee from and do you have any suggestions or tips for me? Thank you! 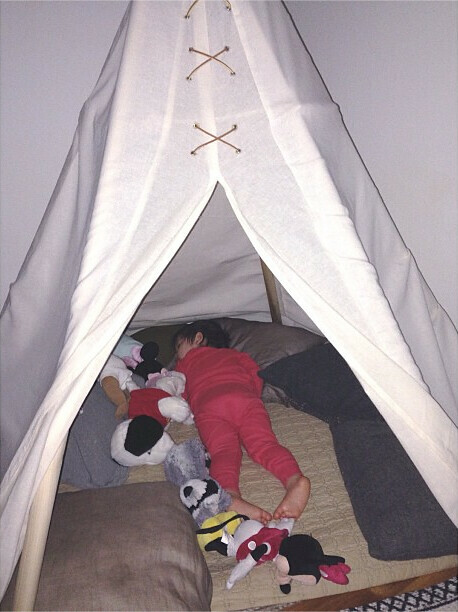 @Samantha – my in-laws made the teepee for my daughter for her birthday a couple years ago. Good luck with the floor bed! Oh sorry a correction to the above. I meant to say that she rolled out of bed at 7 months. This only happened once and I was traumatized. She slept horrible in a crib at this point, so I was nervous about it happening again, thus why we put our bed on the floor. We have just a mattress on the floor no box spring and it’s very thin, thinner than most futons. Okay apparently I am tired as I can not clearly make my point. I also meant to add she did not get hurt at all from Rolling out of our bed. I am just an anxious individual and the thought of her rolling out of our bed kept me from decent sleep for a long time. Thanks so much for this post its nice to know that there are others out there trying the same things we are (yay internet!). Curious if you have any suggestions for me. We’ve been mostly co-sleeping with our almost 8 month old. She has a floor bed too and we’ve had moderate success with it (our bed is on the floor too). But now she’s been crawling for almost a month and has become the champ of crawling, so much so that she won’t ever STOP. She has, up to this point, great sleep habits, falls asleep on her own, regular sleep schedule, minimal night waking – but lately she just wont go to sleep. Especially for naps. I’m all for allowing children to find their own schedule and listening to her body rather than forcing a schedule on her, but she is so tired she can’t sit up and will not fall asleep. Any tips on continuing the floor bed, encouraging her to sleep and not losing my mind? @Nicole – This sounds a lot like my daughter. We used a pack ‘n play for nap times from about 10 months until Fern was about 18 months. She just couldn’t fall asleep with that kind of freedom during the day. It’s OK to modify to make the floor bed work for you. So that’s what we did. Give it a try! And good luck! Ohmigosh!!! 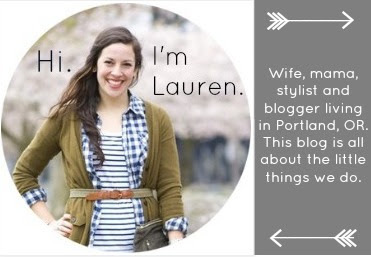 I am sooooo thankful I came across this blog! I have a seven-and-a-half month old that I have been trying to transition out of my bed into a crib. But it just hasn’t been working. It just hasn’t felt right to either of us, and we’re both losing sleep over it! For the last 2 weeks I’ve been sleeping in quilts on her bedroom floor while trying to get her to sleep in her crib. This has resulted in her waking up every 1 to 2 hours, and then eventually sleeping with me on the floor after about two in the morning. It never occurred to me the simple task of taking her mattress out of the crib and placing it directly on the floor could be the answer we were looking for! Or better yet, just buying a full-size mattress for us both to sleep on in her bedroom until she is comfortable on her own. Simple, yet so genius! Thank you! Thank you! Thank you! Oh my goodness, you’ve no idea how happy I am to have found this post. I thought I was strange for having my son sleep on his crib mattress when he moved off our bed. I have issues with my crib and am on board with this way more. It’s already what we are used to. Thanks so much! I made a blog. Post. Linking back to you, I hope that is okay. Just wanted to give you a heads Up. hi, we are soon to move into a two bedroom, and I plan to set Sage’s room up montessori style. She’s ten months and has, for a few months now, been able to stand up in her p&p and it’s killing our sleep. Living in Corvallis Oregon I am curious if you had an issue with the moisture and the mattress being on the floor. I was all ready set go to start buying things since we move next week, but I’ve been reading horror stories about mattresses directly on the floor. I don’t want to buy a frame of foundation as that will raise the bed and perhaps make it difficult and unsafe. Look forward to your thoughts! @Jennifer – That’s a good question. I honestly never thought about it. The only time we had a moisture issue was when we had a problem with a humidifier. I just kept the mattress propped up on it’s side in between bed and rest times to remedy the problem. You could totally do the same thing on a regular basis with yours. My little one is just starting to roll, we have him on a double mattress, we are worried about him rolling off the bed or rolling into the wall and hitting his head. Did you have any issues with this? @Audrey – We’ve always had our floor beds in a corner with the head of the mattress and one side touching walls. I also cut pool noodles in half as a “speed bump” of sorts and put them on the outside edge and the foot of the bed (slid them under the crib sheet). But, honestly the rolling was never a big deal for us. With my daughter we had carpet and the roll onto the carpet wasn’t much and same for my son, though we have wood floor now, so I just laid a cozy rug on the floor next to his bed. Hope that helps. Good luck! @Savina – warm jammies. Fleece footed sleepers are great. Hi Lauren, Thanks for this great, photo-rich post and for continuing to respond to the many great comments and questions. My 9 month old son has been sleeping on a floor bed since 2-3 months but we’ve started having problems, as I see you did, now that he’s becoming mobile. However, the problems we have are that he rolls out of bed in the middle of the night and startles himself. Even though he’s been a through-the-night sleeper since 4 months or so, this has become an increasing problem—uninterrupted nights of sleep feel like a distant memory. We have the pool noodles and a carpet on the floor. The other challenge is that we have his bed away from the walls; when it was up against them, kicking the wall was his favorite morning pastime, which negated those sleep-in benefits of the floor bed. I’m at the point of deciding whether to give up on the bed for awhile like you did (I’m writing this at 3am) but I love how well it has worked so far, and feel like we’re just getting to the stage that the real benefits start to kick in. I also love his ability to sleep on anything that looks like a mattress on the floor (e.g naps at friend’s houses on a folded yoga mat!). I also worry that once he has the ability to stand on his own in a crib, he’ll never sit back down and go to sleep. The other thing I’ve been considering is a pop-up tent we sometimes use when traveling. It reminds me of your teepee. It has edges but he can still crawl out if he wants to. I’m just looking for any last ideas on getting the current situation to work before I move away completely from the floor bed approach. Thanks for any input! I have a 6 month old baby, that is extremely fussy and incredibly active and strong. I love the Montessori approach, and it worked great especially between his 2-4 months, but then the rolling and crawling started to get out of control. He rolls around like crazy, ends up in the rug and starts screaming, or if he finally falls asleep, wakes himself up because of it. We even tucked some pool noodles under the fitted sheet. Today, after reading your post I put him in the pack and play. First nap ever in it. Rolled a bit and fell asleep. I have been so desperate and sleep deprived -even when he sleeps I keep waking up every now and then with an internal alarm to keep an eye on the monitor, hopefully things will get better. You gave me the little push I needed to try this, and to know that it does not mean giving up. (My in-laws don’t get this and insist on buying a crib for us). We might all sleep a little better from now on. Fingers crossed! Hi!! We are co-sleepers (Currently) but I’m looking to move our son (14 months old) to a floor bed soon!! He’s a climber though and I’m worried about leaving our rocking chair, dressers in the room!! Any advice? Hi, Thank you so much for you post. My daughter is almost 9 months old. At night she sleeps in a travel cot (it’s the only thing that would fit in our room) and at day she is in a cot bed downstairs in what will ultimately be her room. I’d love to move her to floor beds in both rooms, predominantly because I want her to have the independence to get up when she is ready and entertain herself, rather than standing in her cot hollering for one of us to rescue her. However she has just learnt to sit up, and almost crawling and she just will not stay lying down. She has always been a great napper and sleeper, down at 7pm in the evening up at 6am. Brilliant! But at the moment with the constant sitting we are constantly up and down the stairs, and with the floor bed she just ends up reversing herself on to the carpet and sitting and crying there till one of us rescues her. Do I give up for a bit, my husband thinks we should wait till she is crawling and she can choose where she wants to be, I thought we should master it before then, any thoughts? @Angharad – I’m a big believer in trying the floor bed approach earlier and just seeing how it works. In my experiences the crawling stage is a difficult stage for kids to be introduced to the floor bed, because they are simply not content to stay in bed since they are so eager to use their new skill. I will say that the floor bed is not for every kid and especially not at the same stage. My son is actually still sleeping in his pack & play, but we are planning to transition him to a floor bed in the next month or so (he is 14 months). Overall, I say trial and effort is key. If it doesn’t work, you can just switch back to the cot and try again later. I hope that helps a bit! Great to read this and know I’m not bonkers for considering ditching the crib! We had a co-sleeper crib for the first few months, then co-slept/used the crib interchangeably. My son is now 9 months and since he started pulling himself up and we dropped the crib base he hates it with a passion. I’ve removed one side of the cot (the base is pretty much at floor level) but he still wants to move around more than his cot mattress allows. Do you think putting two cot mattresses side by side would work? I think he’d be really cosy on a big floor mattress but I don’t want to spend £££ on a mattress in case it doesn’t work out. Or we have a well-used ikea sofa bed mattress… I’m thinking new is advisable? What are people’s thoughts about ‘hazards’ such as curtains, bookcases/shelves and drawers? Just thinking how I can baby proof the bedroom best. Thanks for post ! to be independent from the small baby will help your baby develop the skills needed for later life, this will help to mothers less hard, not always watch over your baby. Great post!!! It answered so many questions and curiosities I had about the Montessori style room and floor bed. My son is 14 months and has never been a good sleeper. We start him in his bed then once he wakes up the first time he won’t go back in his crib so he sleeps in our room. I’m considering trying a floor bed for him. Any thoughts to trying it with an older baby and even a not so great sleeper? My son just turned one but he has been sleeping on a floor bed for the past 5 months. Overall its been great, but I’ve noticed in the last month that I’ll go in to get him in the morning and he will have collected up an item of clothing during the night and is sleeping with it. It’s normally pairs of pants. He has a comforter that he sleeps with. @Kristin – I wouldn’t overthink it. My son enjoyed sleeping with a spoon for months. I say to each his own :). Hi Lauren, not sure if you are still accepting comments on this post but I have a 7 month old on a floor bed and she is on the verge of crawling. I just sold the crib but now I’m nervous. I’m afraid that once she is trying to walk she’ll start pulling herself up on her bookcase or the change table and fall and hurt herself when I am not in the room. Thoughts? @Carly – That is definitely a valid concern, but I will say it was never an issue with either of my kids and my son is a climber of all things. Obviously you should be sure to anchor your furniture and eliminate potential dangers when possible, but assuming you have a monitor in there (which I would recommend), you should be able to keep on top of it. Also, if she goes through a stage where she’s having a challenging time with the floor bed you can always bring a play yard in for her to sleep in for a short period of time. Good luck! Hi. Thanks for the info. Our little Arlo is 6 months old and we use a floor bed. I can’t bounce him to sleep anymore! I see that you used a pack and play , did you keep it in her room? Did you place her in awake and let her sooth herself to sleep with a little crying? We desperately need sleep! @Lori – I kept the pack n play in her room. Also, I always nurse my babies to sleep for probably far longer than is necessary. I finally just ended up having to let them all fuss at a certain point, but only you know when that is. I really think some babies just need to be given the chance to fuss. Clive was like that. Soooo hard to get to sleep and finally let him fuss around 6 months and after that he slept like a dream. He almost always fussed the first 5 minutes for a good year, but always fell asleep. Good luck! Hope you get some sleep soon! Hello! I love the idea of a floor bed. My 11 month old refuses to sleep in his crib but sleep so great in our bed . The only down fall is that we room share. How would you go about doing a floor bed when room sharing? Should we put ours on the floor to and baby proof well? Any thoughts on floor beds with a shared room? My first has used the floor bed in his room since around 4 months and we love it. While expecting my second, I’m assuming i need to plan separate rooms but wondering if a shared room has worked before. They will be about 2 years apart. We have a cosleeper for the first few months. Usually we just cuddle on the couch and he falls asleep. Maybe we need a teepee? My boys weren’t raised with Montessori floorbeds or the room but is it possible to transition them to this type of bedroom style now? They’re 8 and 10 years old. My Son is 2 years now and I’m thinking about a floor bed because I really like the idea. He now sleeps in a sleeping bag but that’s out of the question then. How do you keep your sons warm at night? My sons is a very good sleeper but she really moves around in her crib…..! This is very useful post for me. @Mandy – Good for you, for listening to your little one and doing what’s best for you. It will be the best choice in the long run. Hopefully the floor bed will work again for you in the future :). Hi, I’m planning on using a floor bed for my son (he’s already a little old – 22 months), since I refuse to get a children’s bed just to change it again in a couple of years… anyway, out of curiosity, how long can or should a child use a floor bed? Does your kid still uses it?? if so, how long do you plan on using it? Did you have a changing table in the room also??? I have a 3 1/2 month old and considering switching to a floor bed/montessori style (wish I had done it beforehand) but start with the bed first then progress to other things since he can’t go anywhere yet (sorta)… (he sleeps good only wakes up once a night- hasn’t gone through the 4 month regression…) Im thinking of just putting his crib mattress on the ground before getting a bigger floor bed and just testing it out… but i know he would totally fall out…. we have a “harder” style rug that would protect him over would floor … in the older picture was it a blanket that you folded next to the floor bed?? Thanks! (he would fall bc we already find him sideways and his leg/s out hanging or kicking the side of the crib !